The answer is easily, ‘Yes.’ While I prefer fellow Cannes titles Youth, Carol, and Sicario (this blog’s top three films of 2015), it’s a worthy winner. Dheepan, simply put, is a great film. It might not be on the same level as director Jacques Audiard’s A Prophet or Rust & Bone, both of which lost the Palme to Michael Haneke movies, but it’s a strong, significant film. This tiger roars. Dheepan is an especially exciting addition to stories of migration on film as it dramatizes the experiences of three Sri Lankans who depart their homeland for a new life in the banlieues of Paris. 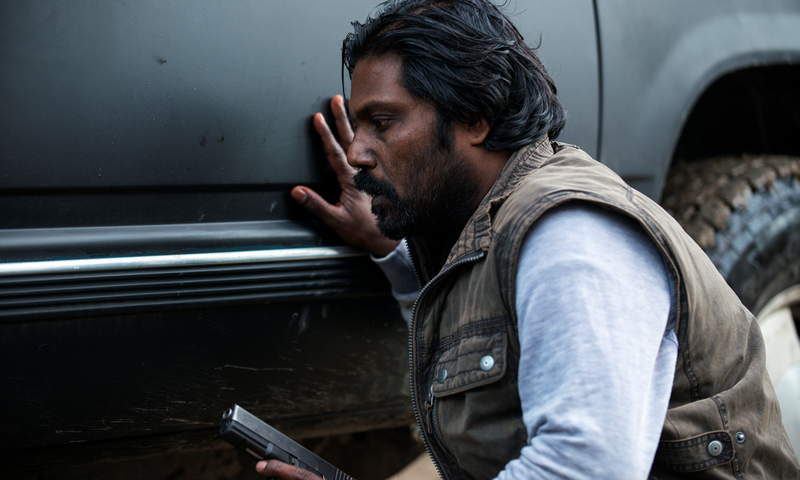 Antonythasan Jesuthasan stars as Sivadhasan who flees his violent life with the Tamil Tigers and moves to Paris using the identity of a dead man named Dheepan. Antonythasan is himself an escapee of the Tigers after spending years with the army as a child soldier, so his performance singes with raw authenticity. Dheepan’s partner in crime is an unnamed woman (Kalieaswari Srinivasan) who takes the passport of the real Dheepan’s wife, Yalini, and together they form a surrogate family with the aid of “Illayaal” an orphan in need of a home (Claudine Vinasithamby). They speak little French, but Dheepan gets a job as the caretaker of a shady suburban housing project. It’s La Haine territory, for sure, as the property manager gives Dheepan more rules of the land than tips on how to run the building that’s a breeding ground for bugs, drugs, and thugs. Dheepan, Yalini, and Illayaal trade violence in one nation for gunfire in another. Their home in the project is a warzone in its own right as competing factions of the underworld exchange fire with disregard for the kids who play in the no man’s land between the towers. Even when Yalini gets a job taking care of an elderly tenant, she’s in close quarters with his son, Brahim (Vincent Rotters), a volatile gangleader who makes Dheepan a marked man when he stands up to the violence that threatens the community. Dheepan simmers with the scars of trauma as the title character struggles to escape his violent past. Existing as a ghost figure with a dead man’s alias, he’s also a member of a community that he longs to escape, as the few Sri Lankans who share his language and culture in France want him to continue the fight with the Tigers that he now rejects. Dheepan’s post-traumatic marks of guilt and unchannelled anger find an outlet in late-night bursts of binge-drinking and singing, which only compound the sense of alienation he feels living in his strange city with a family he barely knows. Yalini’s life isn’t easy, either, as communication barriers leave Dheepan and Illayaal her only companions. Neither one is a piece of a life that she wants, though, for this surrogate family is simply a ticket to a better existence that awaits once the “family” gets its papers and she can skip town. Yalini’s own negotiation of this foreign life appears in her bizarre relationship with Brahim, which develops gradually and tenuously as he appreciates her spicy cooking during visits to his father’s home. They develop a kind of cautious intimacy as they communicate through conversations of broken French—and Dheepan quite effectively illustrates the barriers of language by withholding subtitles at its discretion when characters encounter foreign babble. Their shared presence, however, comforts Yalini despite the danger in making Brahim her ally. Antonythasan and Srinivasan both give remarkably strong, understated performances for their film debuts, while young Vinasithamby adds a layer of complexity to the family’s struggle. Audiard, despite being an outsider to the experiences of these characters, lets the actors propel the drama through the strength and depth of their characters. The film has the rawness, grit, and sobriety that audiences recognise in an Audiard film, yet it’s a brutally compelling departure from his body of work. The film culminates in an explosive eruption of violence that evokes the finale of Taxi Driver as Dheepan retaliates against the violence within the housing project. Dheepan, machete in hand, confronts his own violent past in a riveting, white-knuckle climax as he recognises the futility of a life lived by the sword. Dheepan doesn’t sugar coat this story of migration as Dheepan and Yalini work hard to forge new lives while discovering their new selves in this new land. Audiard’s film conveys the multiplicity of stories that exist within these communities and global cities as Dheepan and Yalini live in a building that’s a microcosm of the world itself, full of stories like their own told by people making similar journeys. The film shows how little one can know about one’s neighbours and the migrants who help shape communities into diverse worlds, as stories of the journey from one home to another go untold and unasked. Dheepan is now playing in Ottawa at The ByTowne and in Toronto at TIFF Bell Lightbox.